• What you can do? 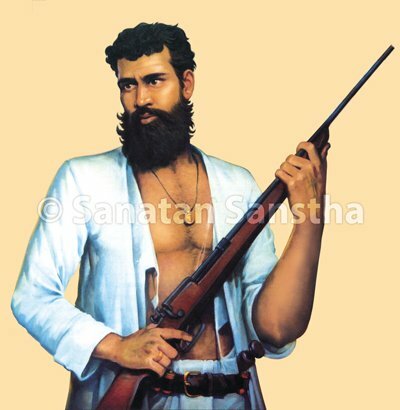 4th November – Birth Anniversary of 'Father of the Armed Struggle' Vasudev Balwant Phadke. 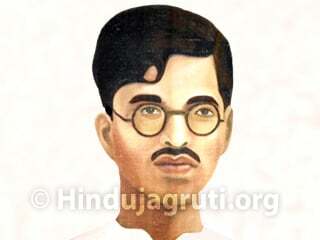 HJS salutes Him on His Birth Anniversary ! Hindu Dharma has a glorious past of great Saints and Sages. Several Saints ascended to the state of a Guru and guided many on the path to God realisation. They also taught spirituality to society at large through their conduct and actions. Their mission was not just limited to spirituality but they also did substantial work for the defence of the Nation whenever it was in difficulty. Some of the Saints traveled all over the world and disseminated the spiritual knowledge of Bharat there without any personal expectations. Millions of people abroad are getting the benefit of that. In the past, for lakhs of years, the Sages have made tremendous efforts to preserve the Vedic Knowledge which is the pride of Bharat. The most important thing however is that the Saints of Bharat have gifted the world with the tradition of the Guru-disciple relationship. In contrast, the current scenario is very different. 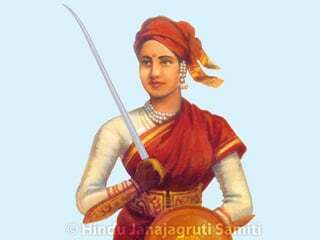 The cricketers, movie heroes and heroines have become the ideals of Hindus. Also the two vices of selfishness and narrow mindedness have become dominant in Hindus which is causing a lot of harm to Hindu society. Under such circumstances it has become essential to study and follow the life of Saints who have imparted the teachings of sacrifice, love, devotion to Righteousness, devotion to the Nation, helping society and kshatradharma (duty of a warrior). We are hereby publishing matter related to them so that people will become aware and take pride in knowing about such great Saints. We pray at the feet of God that Hindus may get the inspiration to study and follow their biography and teachings. 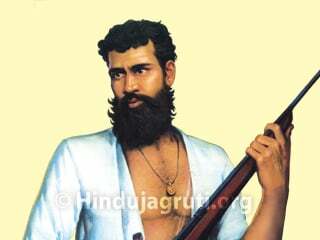 Vasudev Balwant Phadke (Marathi: वासुदेव बळवंत फडके) is widely regarded as the 'father of the armed struggle' of Bharat's independence. He preached that 'Swaraj' was the only remedy for their ills. 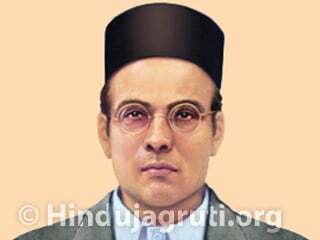 He can, with justice, be called the father of militant nationalism and Hindutva in Bharat. What the Bharatiya Sepoys tried to do in 1857, followed by the Marathas in three bitter wars and then the Sikhs in 1840, but failed, one man attempted – to take on the mighty British Empire single handed. In true Hindu spirit he took a vow to stir armed rebellion and destroy the British power in Bharat and re-establish the Hindu Raj. Vasudev came into the limelight when he got complete control over the city of Pune for a few days by catching the British soldiers off guard during one of his surprise attacks. Phadke was moved by the plight of the farmer community during the British Raj. Phadke believed that 'Swaraj' was the only remedy for their ills. 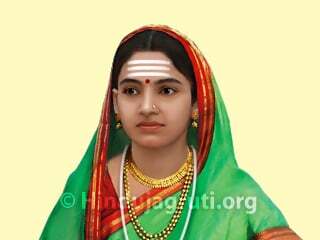 With the help of the Ramoshis, Kolis, Bhils and Dhangars communities in Maharastra, Vasudev formed a revolutionary group called ‘Ramoshi’. The group started an armed struggle to overthrow the British Raj. The group launched raids on rich English businessmen to obtain funds for their liberation struggle. The British Government offered a bounty for his capture. Not to be outdone, Phadke in turn offered a bounty for the capture of the Governor of Bombay, announced a reward for the killing of each European, and issued other threats to the Government. He wrote in his diary, "I wished to ruin the British. From morning to night, whether bathing, eating or sleeping, I was brooding about this and hardly slept in doing so. I learnt to fire at targets, ride a horse, wield a sword and exercise at the gym. I had a great love for arms and always kept two guns and swords". Phadke began to cut the communications of the British and raid their treasury. His fame began to spread. For some time he kept up a heroic unequal struggle with the British and their Pathan underlings under Abdul Haque. Eventually after a fierce fight he was captured in Hyderabad on 21st July 1879. He was charged with waging war against the British Government. Realising that he was far too dangerous an individual to be allowed to remain in Bharat, he was transported for life to a prison in Aden. He was fettered and placed in solitary confinement. Nevertheless on 13th October 1880, undaunted, he escaped. Unfortunately, he was shortly captured again. To protest against the atrocities that he was subjected to, he went on a hunger strike; he died on 17th February 1883. Vasudev was born on 1845-11-04 in Shirdhon village of Panvel taluka based in Raigad district in Maharashtra state in a Marathi Chitpavan Brahmin family. As a child Vasudev preferred learning skills such as wrestling and horse riding over high school education and dropped out of school. Eventually he moved to Pune and took up a job as a clerk with the military accounts department in Pune for 15 years. 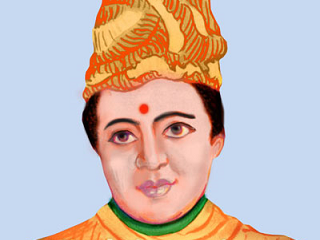 Krantiveer Lahuji Vastad Salve, a then prominent social figure based in Pune was the mentor of Vasudev. Lahuji Salve, an expert wrestler operated a gymnasium. Lahuji preached the importance of independence from the British Raj. Lahuji, who belonged to the Mang community, an untouchable community, taught Vasudev the importance of getting backward castes into the mainstream freedom movement. It was during this period that Vasudev began attending lectures by Govind Ranade which mainly focused on how the British Raj policies hurt the Indian economy. Vasudev was deeply hurt by how this was leading to widespread suffering in society. In 1870, he joined a public agitation in Pune that was aimed at addressing people's grievances. Vasudev founded an institution, the Aikya Vardhini Sabha, to educate the youth. While working as a clerk, Vasudev was not able to see his dying mother due to a delay in gaining approval for his leave. This incident enraged Vasudev and happened to be the turning point in his life. In 1875, after the then Gaikwad ruler of Baroda was deposed by the British, Phadke launched protest speeches against the government. Severe famine coupled with the evident apathy of the British administration propelled him to tour the Deccan region, urging people to strive for a free republic. Unable to get support from the educated classes, he gathered a band of people from the Ramoshi caste. People from the Kolis, Bhils and Dhangars were also included later. He taught himself to shoot, ride and fence. He organised around 300 men into an insurgent group that aimed at liberating India from British rule. Vasudev intended to build an army of his own but lacking funds they decided to break into government treasuries. The first raid was done in a village called Dhamari in Shirur taluka in Pune district. The income tax which was collected for the British Raj was kept in the house of a local businessman Mr. Balchand Fojmal Sankla. They attacked the house and took the money for the benefit of famine stricken villagers. There they collected about four hundred rupees but this led to his being branded as a dacoit. To save himself Vasudev had to flee from village to village, sheltered by his sympathisers and well-wishers, mostly the lower class of society. Impressed by his zeal and determination, the villagers of Nanagaum offered him protection and cover in the local forest. The general plot would be to cut off all the communications of British forces and then raid the treasury. The main purpose of these raids was to feed famine-affected farmer communities. Vasudev performed many such raids in areas near Shirur and Khed talukas in Pune. Meanwhile, Vasudev continued his raids and increased his follower-base. The monetary situation of the movement improved. But then Vasudev had a realization that the people around him were more interested in his loot, or wealth, than in the ideals that he wanted to fight for. Vasudev decided it was time for him to find a new place. He decided to move to the south, and headed for Shri Shaila Mallikarjun shrine. After overcoming this moral defeat, Vasudev again recruited about 500 Rohilas to form a strong army to start a fresh fight against the British Raj. Vasudev's plans to organize several simultaneous attacks against the British Raj, nation wide, were met with very limited success. He once had a direct engagement with the British army in the village of Ghanur. Thereafter the government offered a bounty for his capture. Not to be outdone, Phadke in turn offered a bounty for the capture of the Governor of Bombay and announced a reward for the killing of each European, and issued other threats to the government. He then fled to Hyderabad State to recruit Rohilla and Arabs into his organisation. A British Major, Henry William Daniell and Abdul Haque, Police Commissioner to the Nizam of Hyderabad, pursued the fleeing Vasudev day and night. The British move to offer a bounty for his capture met with success: someone betrayed Phadke, and he was captured in a temple after a fierce fight at the district of Kaladgi on 20 July 1879 while he was on his way to Pandharpur. From here he was taken to Pune for trial. Vasudev and his comrades were housed in the district session court jail building, near Sangam bridge, which now happens to be the state C.I.D. building. His own diary provided evidence to have him sentenced for life. Vasudev was transported to jail at Aden, but he escaped from the prison by taking the door off from its hinges on 13 February 1883. But his escape was too short lived: he was recaptured and put back in prison. Vasudev then went on a hunger strike to death. On 17 February 1883 Vasudev breathed his last breath as a result of his protest hunger strike. One of the reasons for Vasudev to be known as the father of the Indian armed rebellion was the fact that he was the source of inspiration for a couple of fellow freedom fighters. 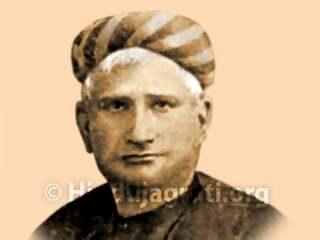 Bankim Chandra Chatterjee's famous patriotic novel Anand Math incorporated various contemporary acts of patriotism performed by Vasudev during his freedom struggle. As the British government didn’t like this, Bankim had to print up to 5 editions of the book to tone down these stories. 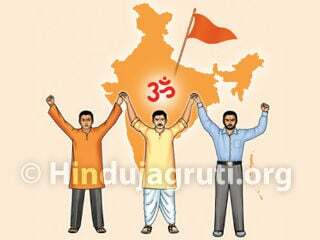 What you can do to protect the Nation & Dharma? 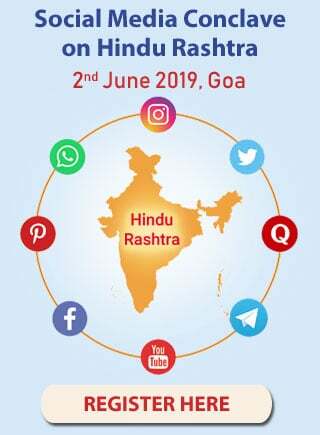 Write a protest letter to the concerned authorities and Government against any defamation of the National flag, National map, National hero’s and Hindu deities. Oppose conversion as conversion means changing nationality. Lodge a police complaint and pursue the matter of such defamations and conversion. And the most important is to start spiritual practice to attain the blessings of God and Saints to have success in your mission.